For over 15 years I’ve been working in project management in both the residential and commercial setting. As a licensed contractor, I owned my own contracting company specializing in custom kitchens and bathrooms, as well as structural remodels. Prior to that, I managed Home Depot’s installation department for North Jersey for a number of years. During this time, I’ve managed a lot of moving parts. I take great pride in running my remodeling projects smoothly and proactively. All the while, I’ve delivered projects that are on time and on budget. Additionally, I’m focused on completing a top-quality remodel. My goal is to make the remodeling process as pleasant and stress-free for my clients as possible. The environment at Monk’s Home Improvements is ideal. The entire in-house team is all focused on a single goal. I enjoy working with professionals who are committed to delivering top-quality work and customer service. 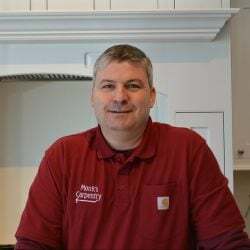 I look forward to working with you on your kitchen, bath, or other home remodeling project. Estimate appointments are Tuesday – Saturday. Additionally, make an appointment with a Designer in our Showroom. You’ll receive undivided attention for an hour and a half with a Designer working off your plan. You can shop for Cabinetry, Countertops, Tile, Flooring, Hardware, Vanities, Windows & Doors.